Virat Kohli the captain of RCB won the toss and choose to bowl first. IPL 2018 RCB vs KXIP match is being played in M Chinna swami Stadium Bengaluru. Match started KL Rahul and Mayank Agrawal came to open KXIP' inning. 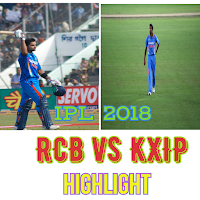 KL Rahul hit consecutive sixes in first over KXIP 16/0 in 1st over. KL Rahul hit a six in Chahal's bowl. Karun Nayar hit an unforgettable uppercut for the boundary. at the end of 8 over 71/3. Bowlers of RCB is doing well.KXIP scored 84 in 10 over for the loss of 3 wickets. Krish Wocks got the wicket of Andreu The in 18th over. Ashwin stumped this is the 9th wicket taken by Yajuwendra Chahal. KXIP scored 155 all-out in 19.2 over. RCB started inning to chase target to win 156. Virat Kohli and ABDewilier and other players also played very well.